For this look, I started our model Markie’s makeup while her hair was in hot rollers so we could achieve that gorgeous 1950’s glam hair. Apply a light coat of cream foundation on the face and neck. For this video, I used the Cinema Secrets palette from the 300 series. I used the color 300-65. Apply concealer under the eyes. I used the lightest color from the same Cinema Secrets palette as the concealer. Brush the eyebrows upwards and set with hairspray or eyebrow gel. Then, take liquid eyeliner and line the eye. Add a wing to the outer corner of the eye. The eyeliner wing should be short and not too perfect. Its purpose is more to life up the eye verse making it too obvious. Take your time with the eyeliner, as it can be tricky to do it freehand. For this, I used Pat McGrath Labs Metalmorphosis 005 Black Dual Ended Eyeliner. With the eyes shadow color “Rich Brown” by Bobbi Brown, draw a soft line under the eyes. Apply 2 coats of black mascara to the top lashes. Legendary Lashes Mascara by Charlotte Tilbury is always our mascara of choice. While waiting for the mascara to dry, use Ben Nye #40 spice eye shadow as a blush and apply it to the cheeks. Now coat the bottom lashes with the same mascara. Do 2 coats to make the lashes a little clumpy. Then, fill in the whole lips with the same liner. Fill in your eyelashes lashes with KATLash “Unique 1” eyelashes. Then, use KATLash “Unique 2” on the outer corner of your eyes. And there you have it! I brushed out the hot rollers and teased up the hair a bit. I put her hair up in a “spaghetti hair” style, which, by the way, was invented by Brigitte Bardot, herself. 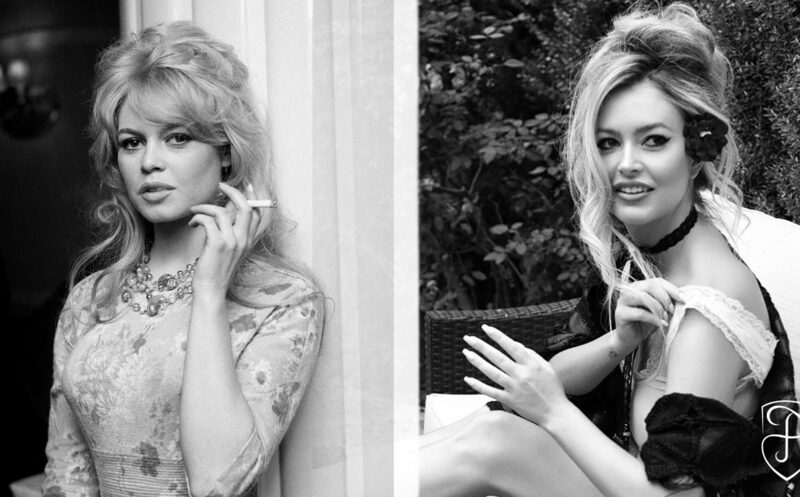 And that gave us our final Brigitte Bardot 50’s look. Flip through to see all of the photos of our final look, and be sure to post photos of your Brigitte Bardot look and tag Fashionisers on Instagram!